Happy New Year! Finally the year 2013 has come with full of joy and happiness for all of us. 2012 was a very long year for me and this blog. Since I moved to America earlier this year, there have been a lot of difficulties and I found it almost impossible to maintain this blog throughout the year. Therefore, I am so glad that I and our writer team did a great job to make 2012 a successful year. Although I was away and almost disconnected for a month, our team still managed to publish new articles everyday. There were overall 434 posts published on this blog in 2012, that means we are publishing more than 1 post per day. This is a very impressive number if you notice that I contributed just half of those articles. I can’t find the best words to say thank you to all writers here in the last year. I often set new year resolutions for this blog on the 1st day of new year. On the same day last year, I set some goals about revenue, traffic and ranking. Although some goals haven’t been completed, I am still happy that other important goals were accomplished sooner than expected. Below is the traffic and income report of TechWalls in 2012. The traffic was so consistent throughout the year 2012. The beginning and end points are nearly at the same level. There were overall 368,898 unique visitors and 520,361 pageviews. The visits mostly come from search engines like Google and Bing (75%), other traffic sources include referral (12%), direct (12%) and social networks like Twitter and Facebook. It is notable that the traffic from Twitter is three times as much as Facebook. This is very surprising because I spend much more time promoting blog posts on Facebook. Facebook could not be as effective as we think. The pie chart represents all of my online incomes in December 2012. The overall gross incomes reached a new milestone in the last month. 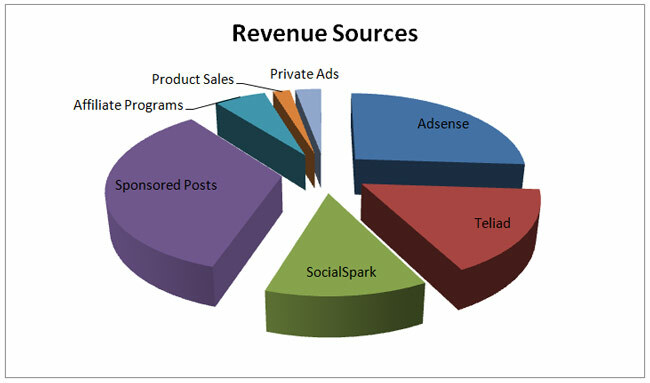 Adsense, sponsored posts, SocialSpark and Teliad are still the most important revenue sources. Although Adsense is no longer the best revenue source, I still find difficult to find the alternative. The smallest percentage of this pie chart belongs to Product Sales (2%). I started a new website to sell a digital product since November and the good news is that we got the first 2 sales in December. I can’t disclose the website at the moment because it is still in experiment and others could steal the idea, just like the case of Pat Flynn when his readers replicated the niche of security guard training. Although Product Sales is contributing very small income at the moment, this is the most anticipated part, I expect it will grow larger in 2013. We always receive the most profit when we can sell our own stuff instead of helping promote others’ products. If you are making money from your blog, share with us your traffic and income in 2012. Are you happy with your online incomes in the last year? It is so difficult to make money from blogging and that’s why I need to develop my own product. Hopefully it will become more popular. First of all, happy new year Tuan. It’s really good to see you publishing your stats of the year 2012, that will obviously inspire a lot of newbie bloggers out there. Looks like your traffic is at the same level, but US & UK traffic is always better :). My new tech blog is also doing pretty good at the moment. It has already crossed the 50k UV mark in December. I hope to see some further improvements in the coming months. And yeah, best of luck for 2013 :). 50k UV for a new blog is huge. Congrats, mate.